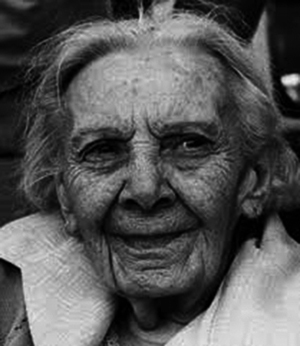 , Aboriginal community leader, was born on 27 August 1904 at Wright Court, Adelaide, daughter of John Herbert Walters, gas-meter inspector, and Gertrude Adams. Her maternal great-grandmother was Kudnarto, a woman of Kaurna-Ngadjuri descent, who had married English-born Tom Adams in 1848. At 8 months Gladys Adams was taken to live with relations at Point Pearce Mission Station, Yorke Peninsula. Educated at the local school, as a child she rode horses, swam, played sports and taught herself the organ. Leaving school at 12, she worked at the station dairy. Women Elders trained her as a midwife. On 13 June 1922 at the Point Pearce Church Gladys married with Methodist forms Walter Stanford Hughes, a shearer. They had two sons. Her husband died in 1937; two years later she moved to Adelaide and found work as a domestic. On 2 December 1940 at St Ignatius' Catholic Church, Norwood, she married Frederick Joseph Elphick (d.1969), a soldier. They resided first at West Thebarton and later at Ferryden Park. Employed during World War II at the South Australian Railways' Islington workshops, producing munitions, she won an award for a shop-floor invention. In the 1940s Mrs Elphick joined the Aborigines Advancement League of South Australia and in the 1960s served on its activities committee, which organised social and sports events. As founding president (1964-73) of the Council of Aboriginal Women of South Australia, she worked to raise the status of Indigenous people in the community. The council employed a social worker, set up various sports clubs and arts and crafts groups, and encouraged women to learn public speaking so that they could confidently express their ideas. Members campaigned for the `Yes' vote in the 1967 referendum that ensured Federal responsibility for Aborigines, and lobbied for the franchise and Aboriginal rights generally. They established a women's shelter and health service in Adelaide, and took steps to set up a legal aid service and a kindergarten. In 1973 the women's council changed its name to the Aboriginal Council of South Australia and included men in the organisation. That year the Aboriginal Community Centre was established to house the various services; Elphick was elected treasurer and was later made a life member of the centre. She was a founder (1977) of the Aboriginal Medical Service. In 1966-71 Mrs Elphick was a member of the South Australian Aboriginal Affairs Board. She was appointed MBE in 1971. An advocate of adult education courses for Aborigines, in the 1960s she had helped to arrange evening art classes, conducted at Challa Gardens primary school by John Morley. These and other programs led to the establishment in 1973 of the College of Aboriginal Education, as part of the Underdale campus of the South Australian College of Advanced Education. Known as `Aunty Glad', Elphick, according to Kevin Gilbert, possessed a `lively sense of humour' and `a shrewd personality' that pierced through `humbug'. A highly respected elder, in 1984 she was named South Australian Aborigine of the Year. She died on 19 January 1988 at Daw Park, Adelaide, and was buried in Centennial Park cemetery. Her elder son, Timothy Hughes , had predeceased her; her son Alfred survived her. In 2003 the Aboriginal women's group advising the International Women's Day Committee (South Australia) presented the inaugural Gladys Elphick award.